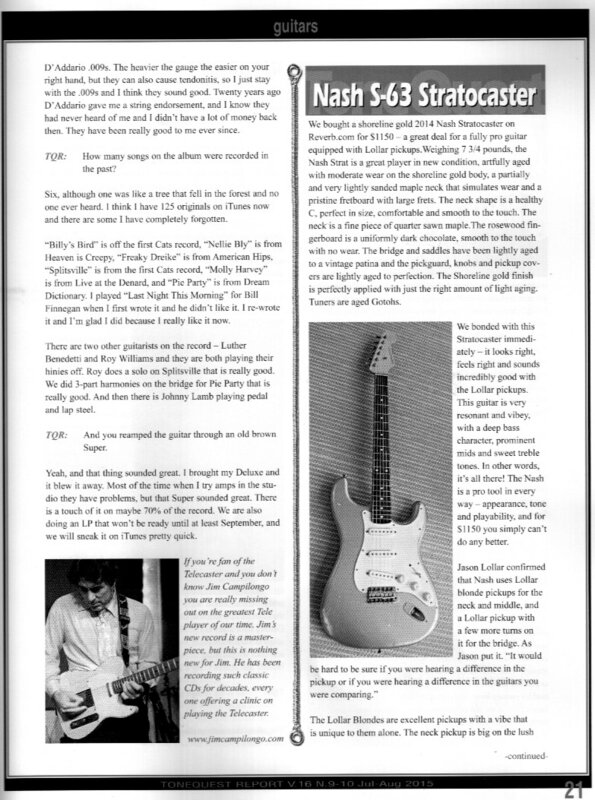 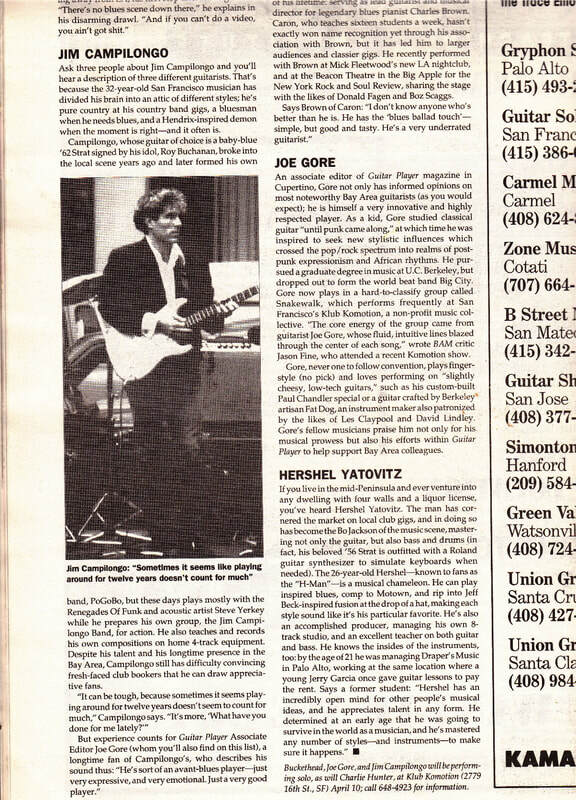 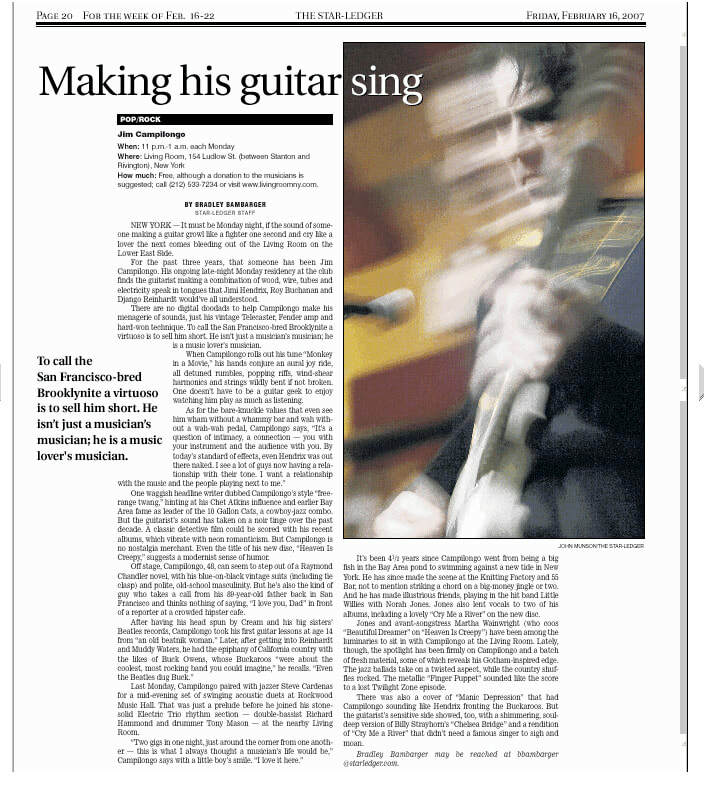 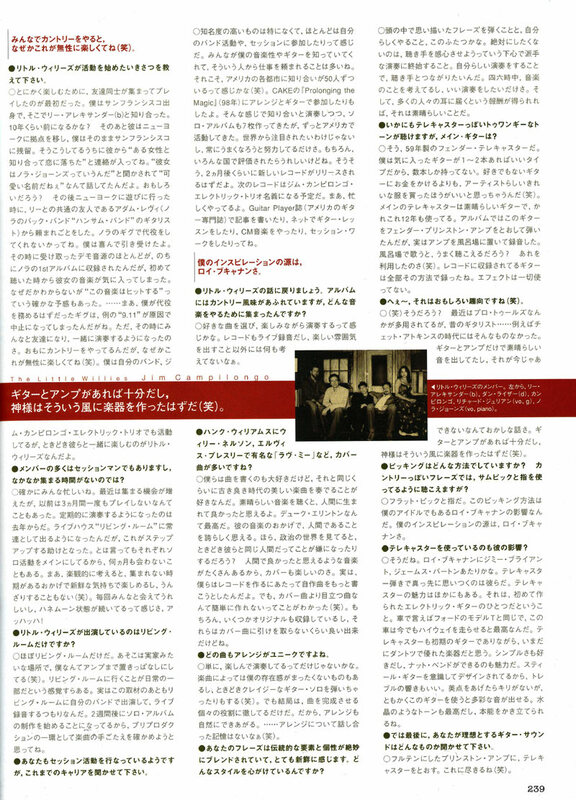 Jim Campilongo in Scott Yanow's book "The Great Jazz Guitarists"
GUITARIST UK "ON THE RECORD"
Guitar Player Magazine - 2006 - "Free Range Twang"
"Jim Campilongo, now on his third album, is one of the treasures of American music, in terms of the guitar...Table for One is his most mature and refined album - an entirely instrumental work, of a mostly 'after hours' tone and mood..."
LITTLE WILLIES "FOR THE GOODTIMES"
Billboard Magazine calls Jim Campilongo "an American treasure", an accolade which this guitarist's artistry and influential career has richly earned him. 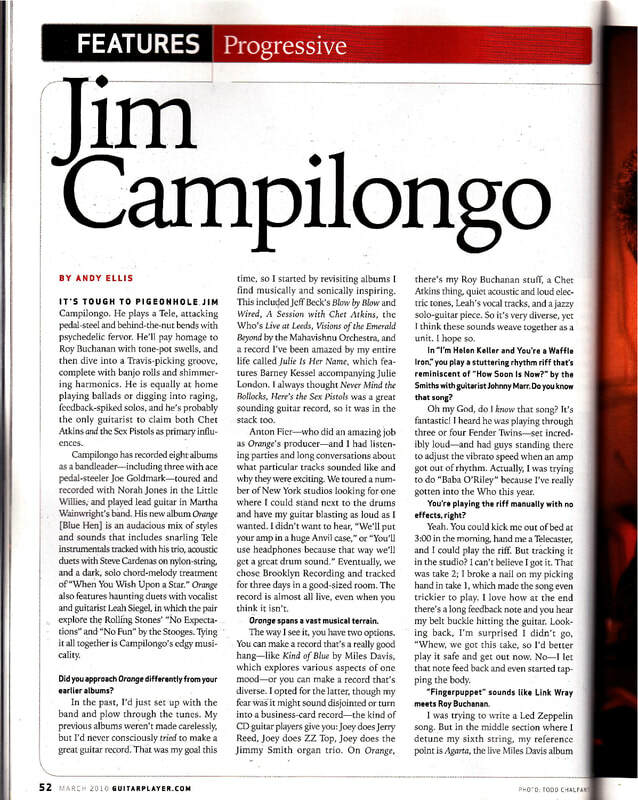 TIMEOUTNYC describes Campilongo perfectly- ”New York has no shortage of guitar heroes but few cover as many bases as Jim Campilongo reveals a range that extends from seductive country-swing to atmospheric jazz and well beyond.” and the NEW YORKER says "There it was again: the stinging treble, the spooky overtones, the strings snapping and booming under his hands the sound of a Tele being played as skillfully and exuberantly as it can be played it sounded like nothing and nobody else sounded like Jim Campilongo." 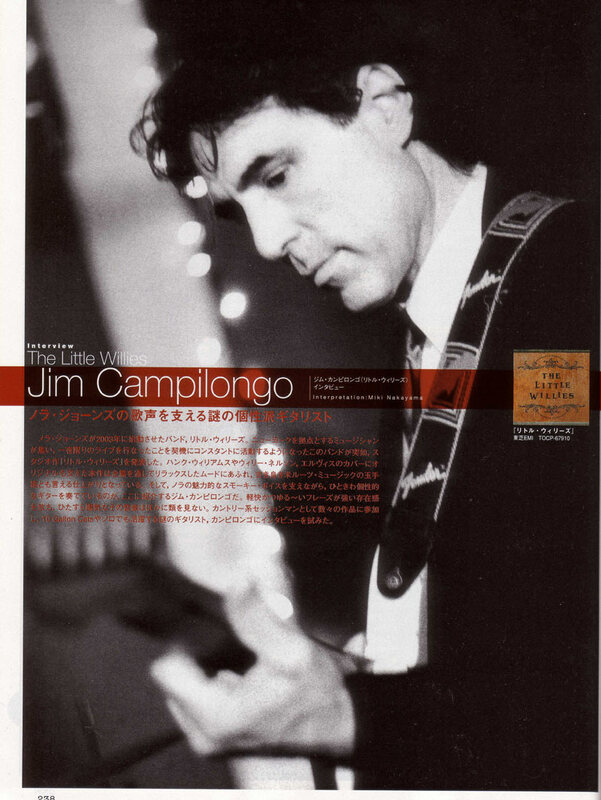 With eleven albums of original material and guest appearances on dozens of recordings -- from the Bammie-winner's contribution on Cake's million-selling Prolonging the Magic to (most recently) doing lead guitar duties with The Little Willies, his band with Norah Jones -- Campilongo has played with JJ Cale, Al Anderson, Gillian Welch/David Rawlings, Peter Rowan, Martha Wainwright, Bright Eyes, Teddy Thompson, and Burning Spear to name a few, has earned two Gold records, and has written music for national ads for National Grid, Volkswagen, SBC, Michelin and Jack Daniel's. 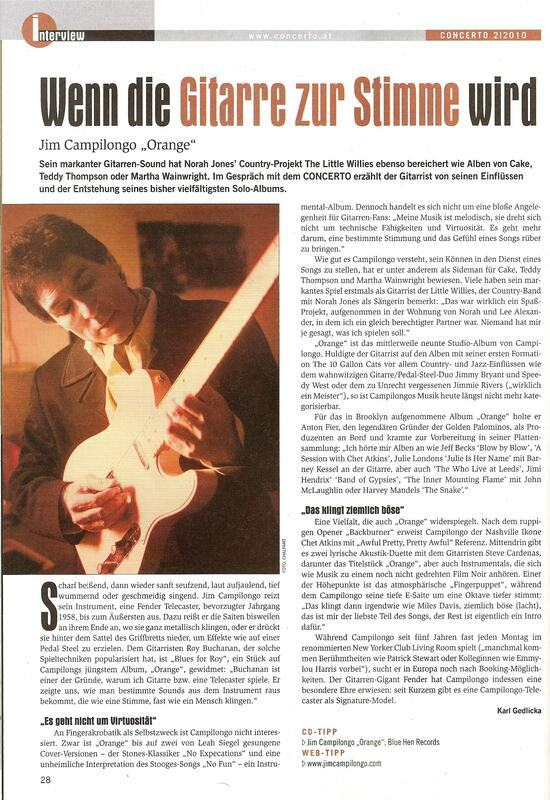 Campilongo also had repeat appearances on The Late Show with David Letterman, Late Night with Conan O'Brien, Later . 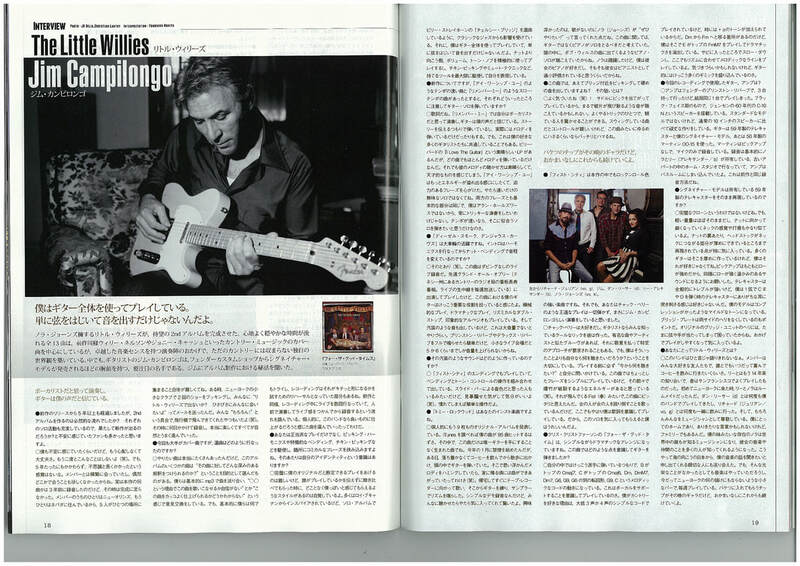 . . with Jools Holland (BBC), Abbey Road Sessions (BBC), and has been interviewed on many major radio shows. 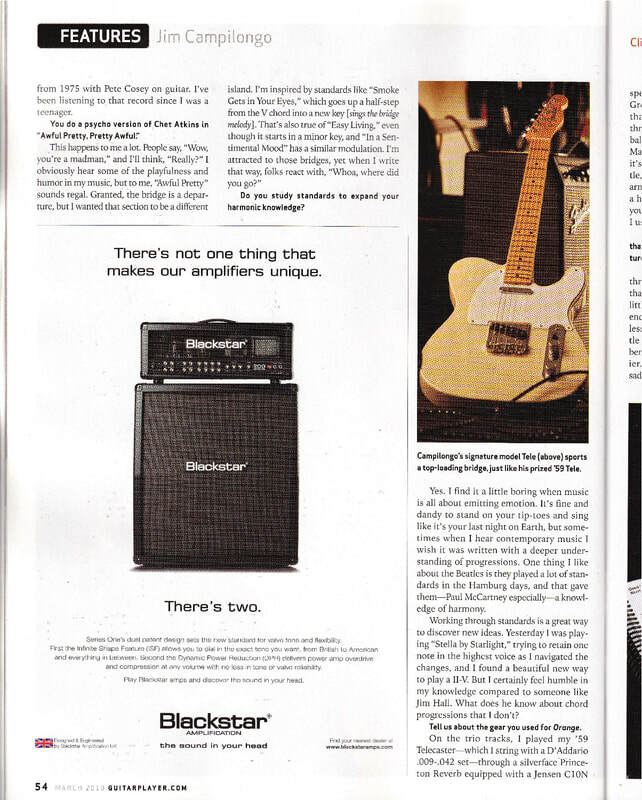 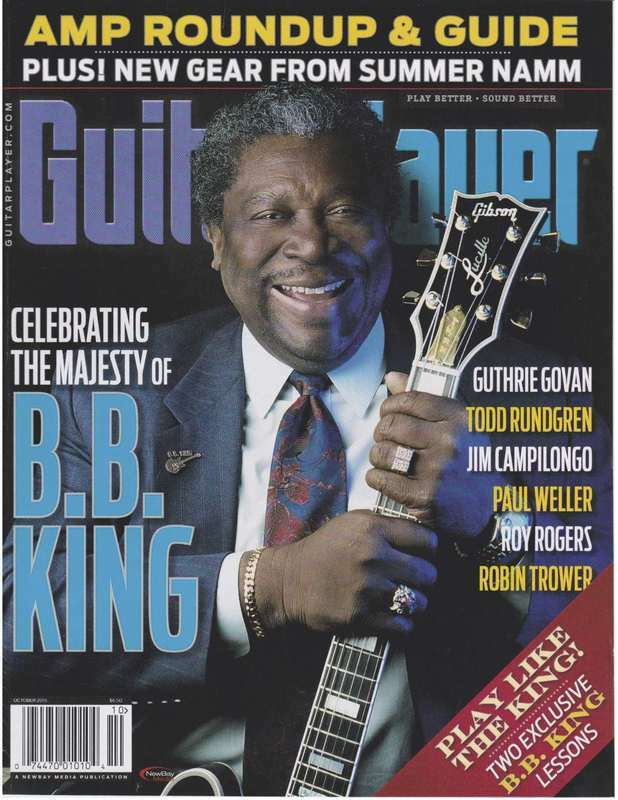 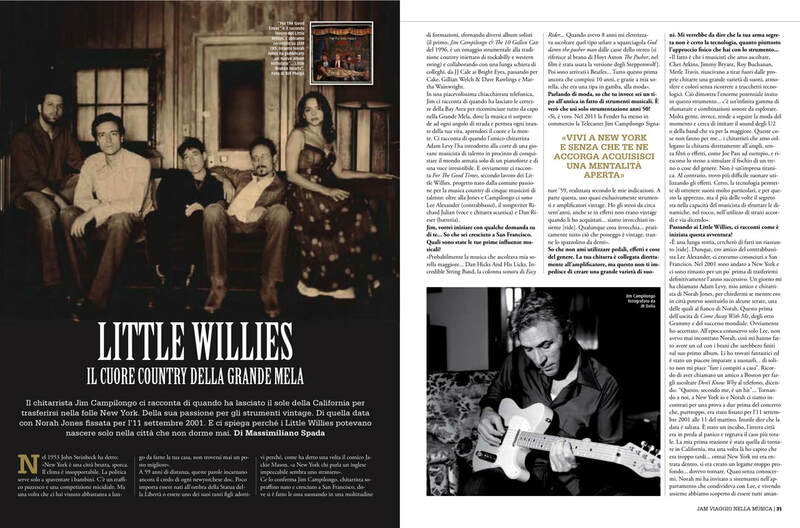 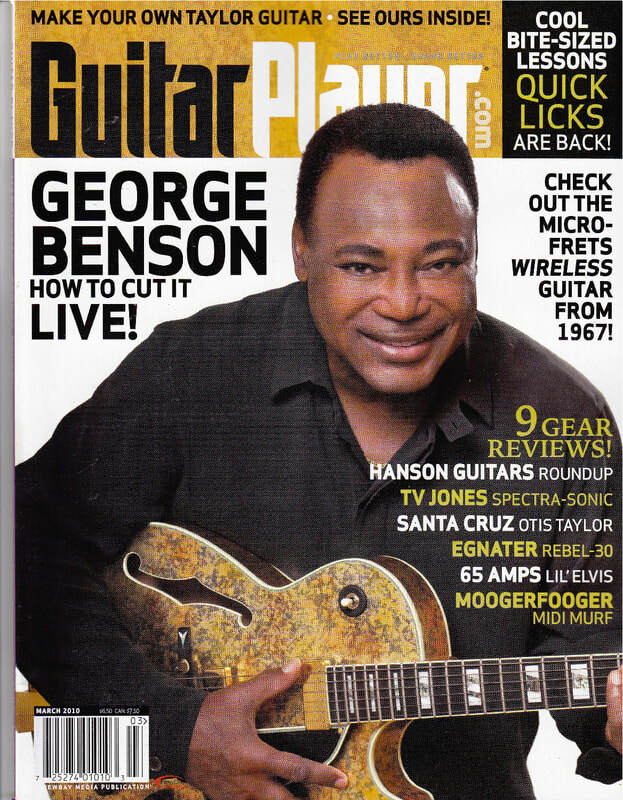 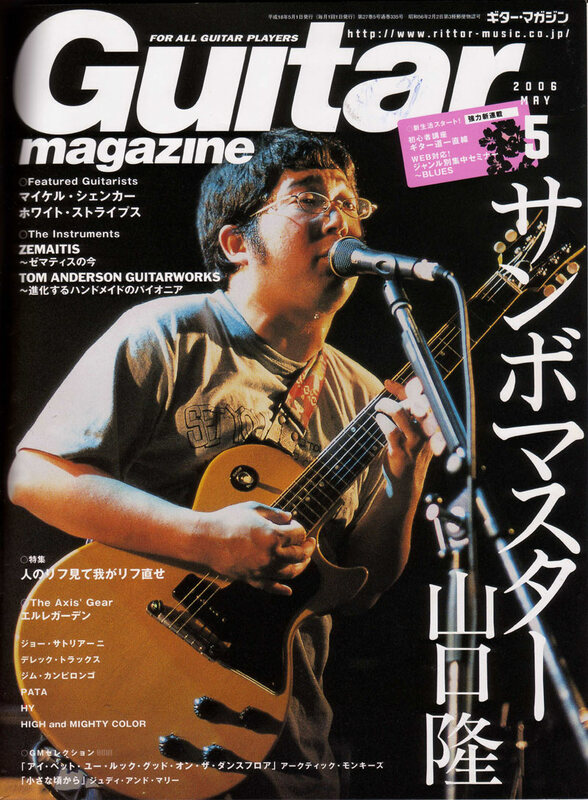 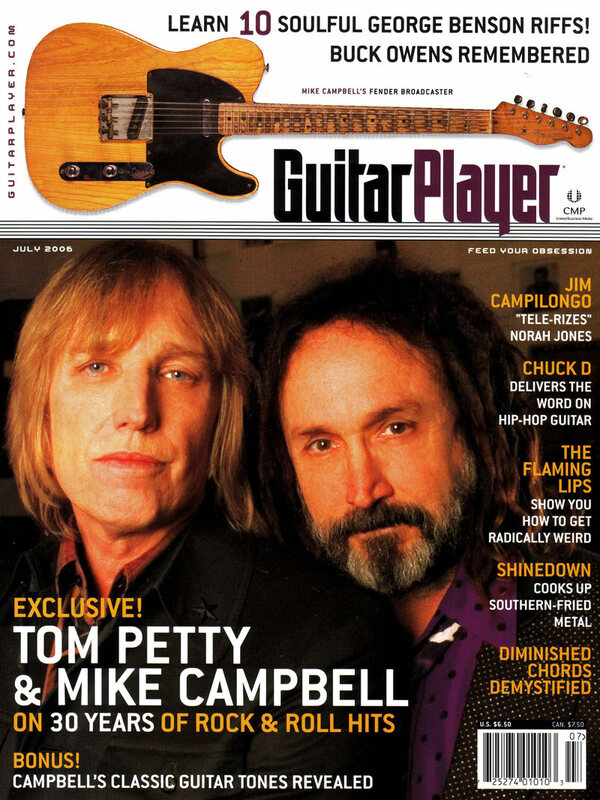 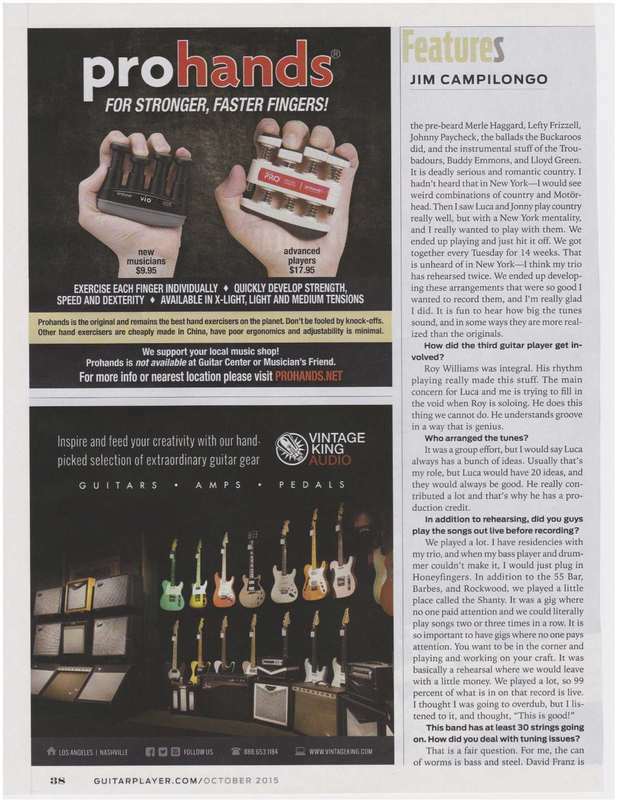 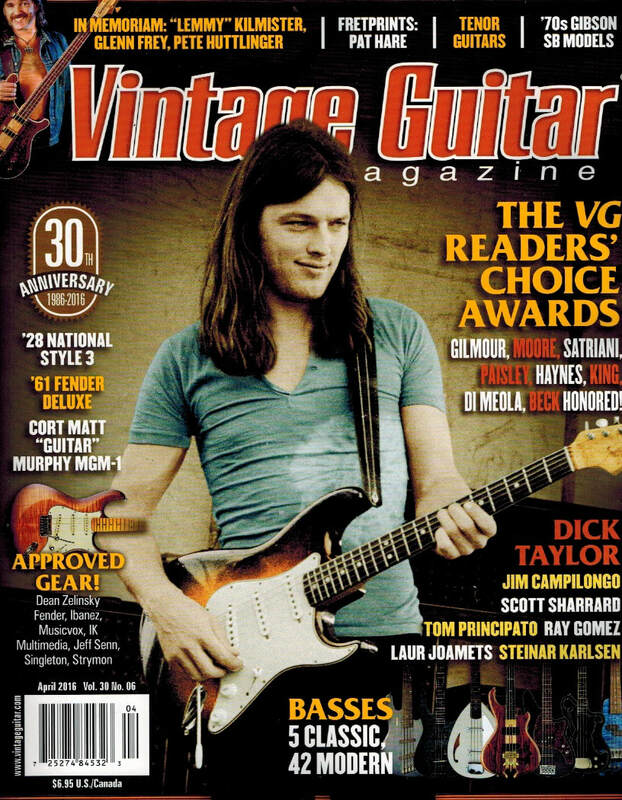 Additionally, Campilongo is a published guitar teacher and contributing editor for Guitar Player Magazine. 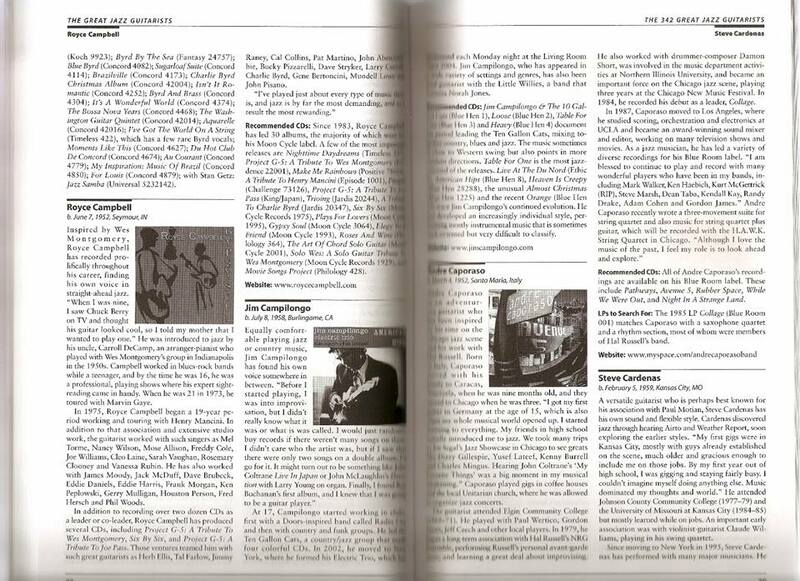 Jim’s monthly column “Vinyl Treasures” has a large dedicated following. 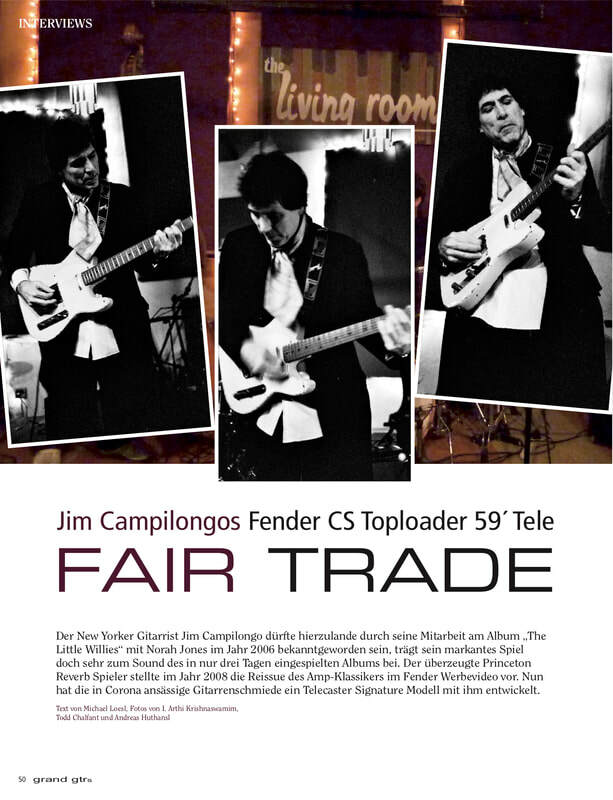 Campilongo's TrueFire instructional video "Sonic Tele" continues to be a best seller along with his popular, homespun "Lessons By Mail", offered on jimcampilongo.com. 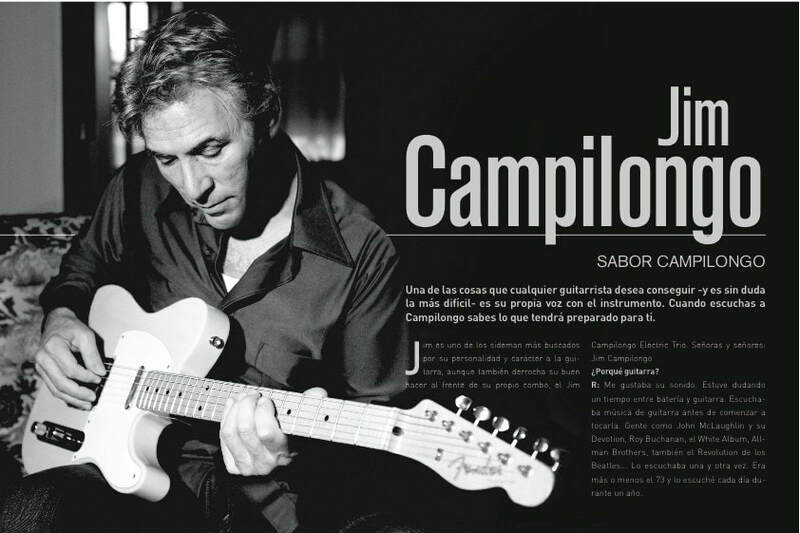 Campilongo's virtuosity and originality has inspired a generation of guitar players. 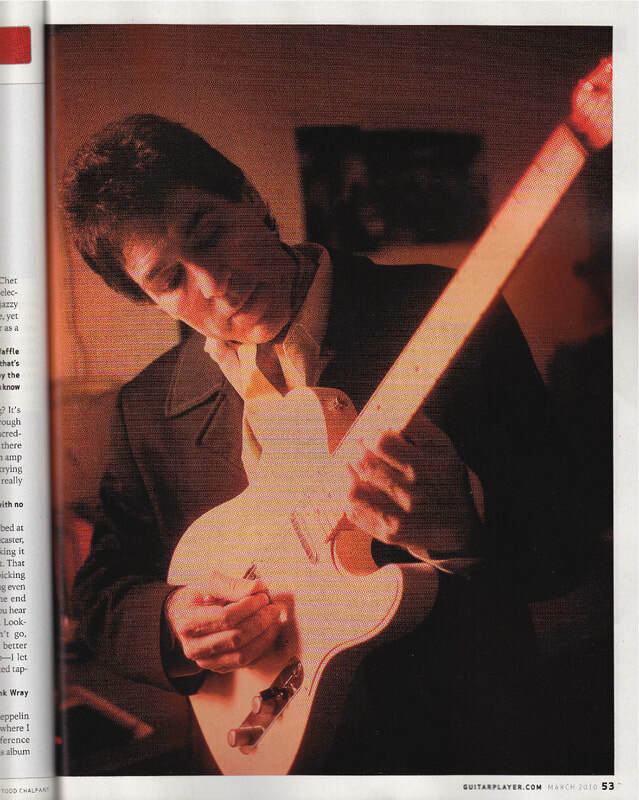 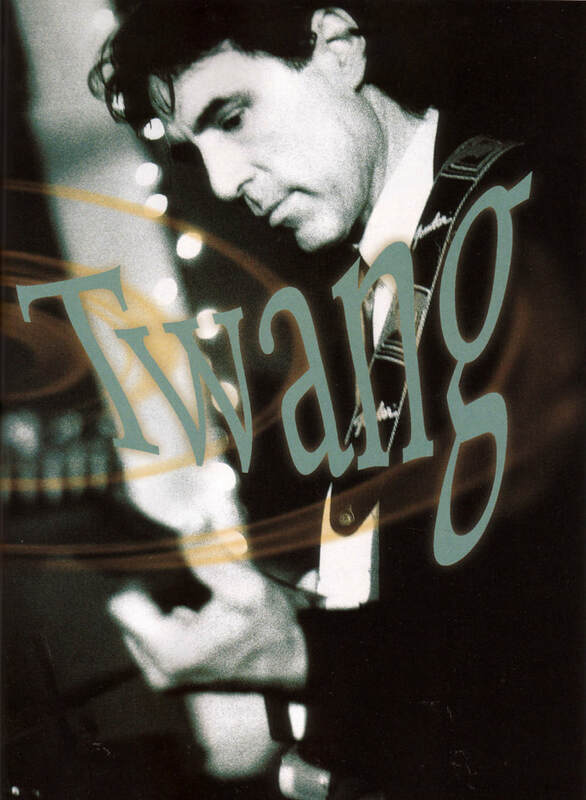 His songwriting uses a palette of the best in Blues, Country, Jazz and Rock with a sensitivity and wit that has also earned him the broad fan base most instrumental guitarists never enjoy. 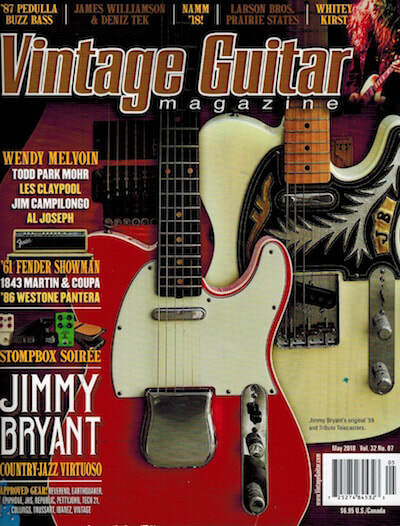 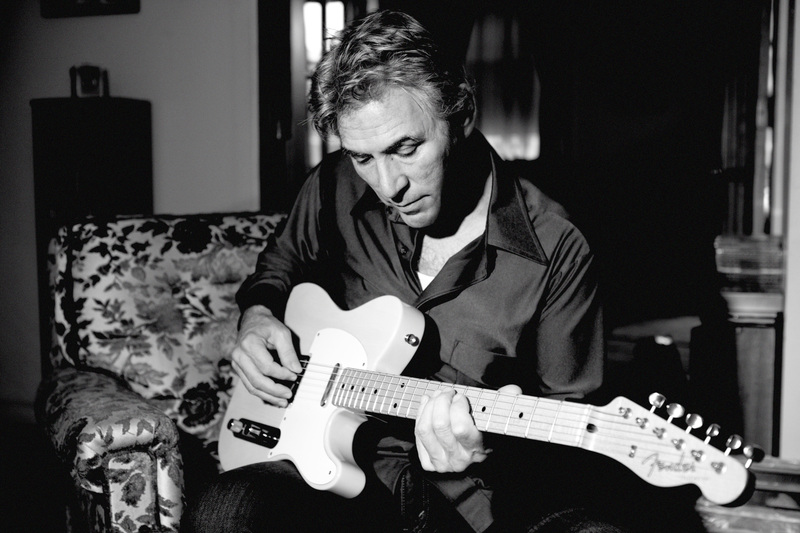 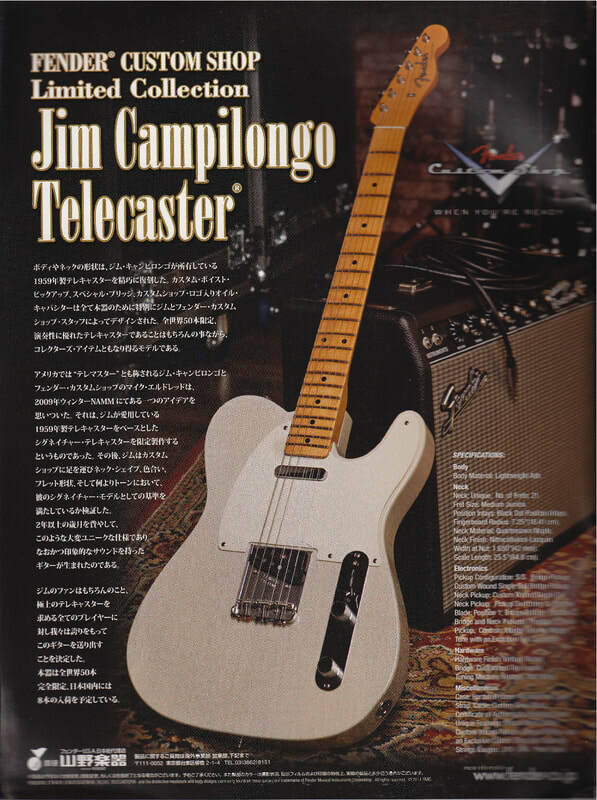 In 2013, Fender Guitars bestowed Jim the honor of the Campilongo Signature Telecaster, a high quality instrument made by Fender's elite Custom Shop. 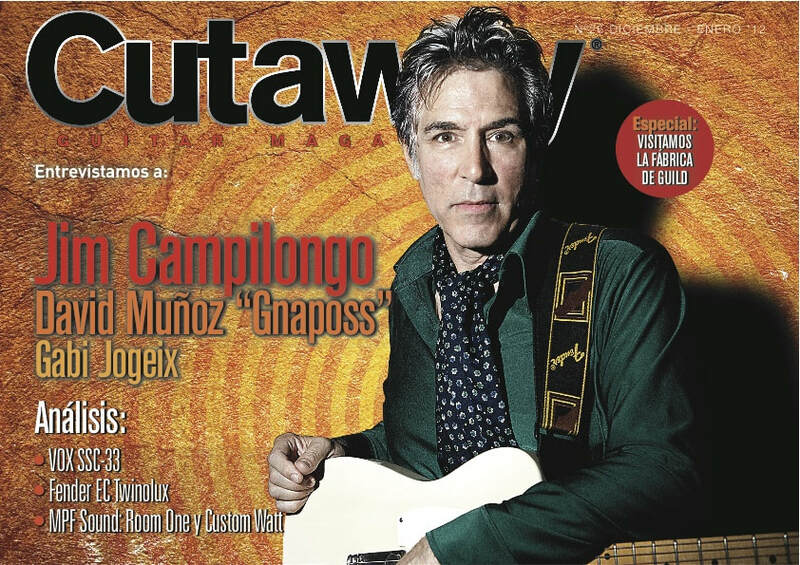 Campilongo is also a featured endorser of D'Addario string company, Celestion speakers and Lava cables. 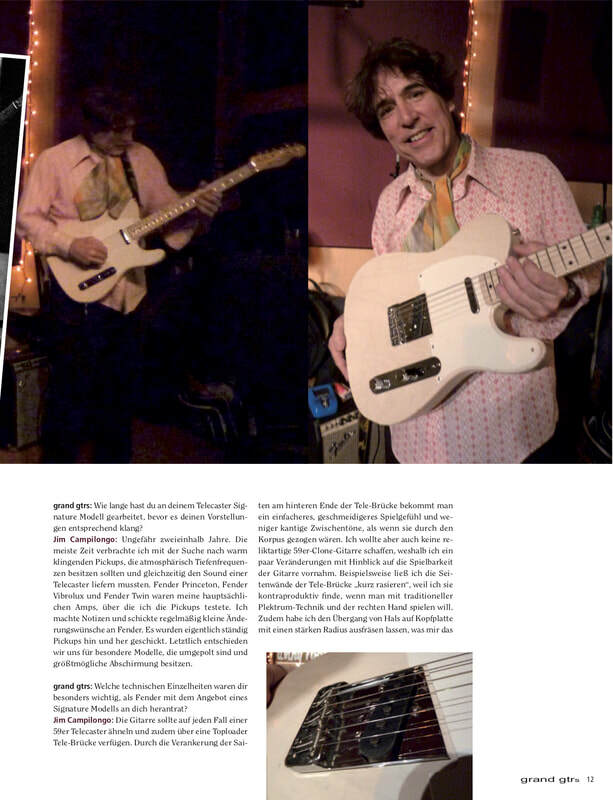 In 2017 master guitar builder Chihoe Hahn collaborated on the Hahn Jim Campilongo Model C Telecaster- a boutique guitar of the highest quality at an affordable price. 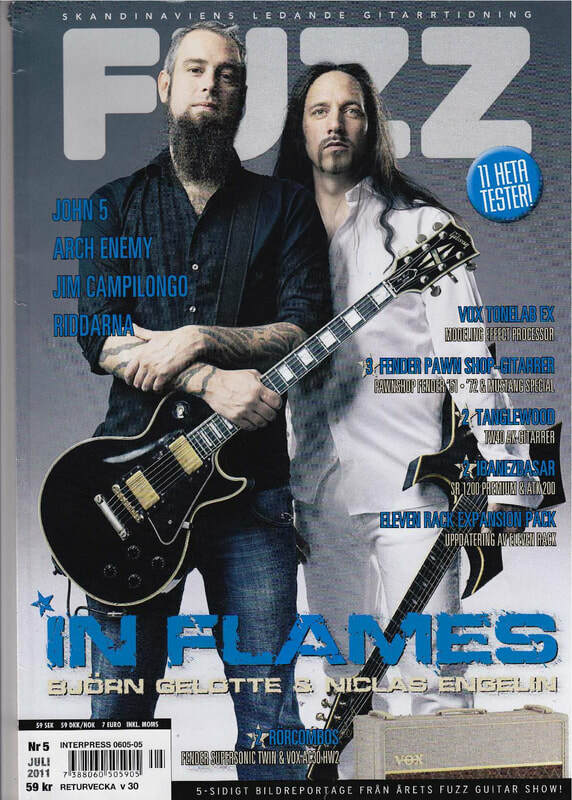 Chihoe and Jim are delighted with the rave reviews and interest. 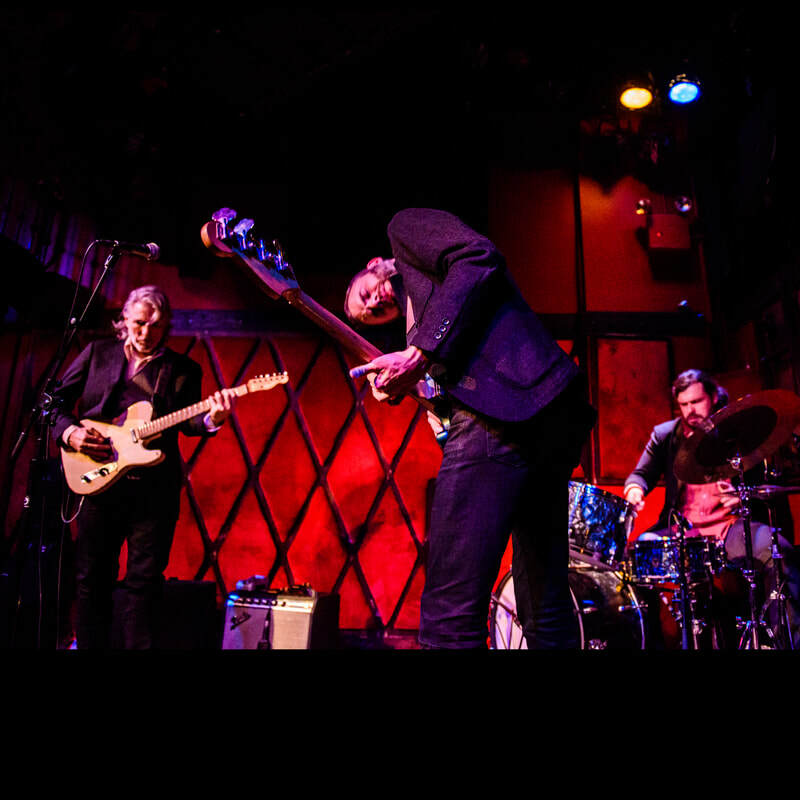 In 2018 Jim released his 12th record “Jim Campilongo with Chris Morrissey and Josh Dion Live at Rockwood Music Hall NYC” - an album of the best performances from over one hundred live shows. 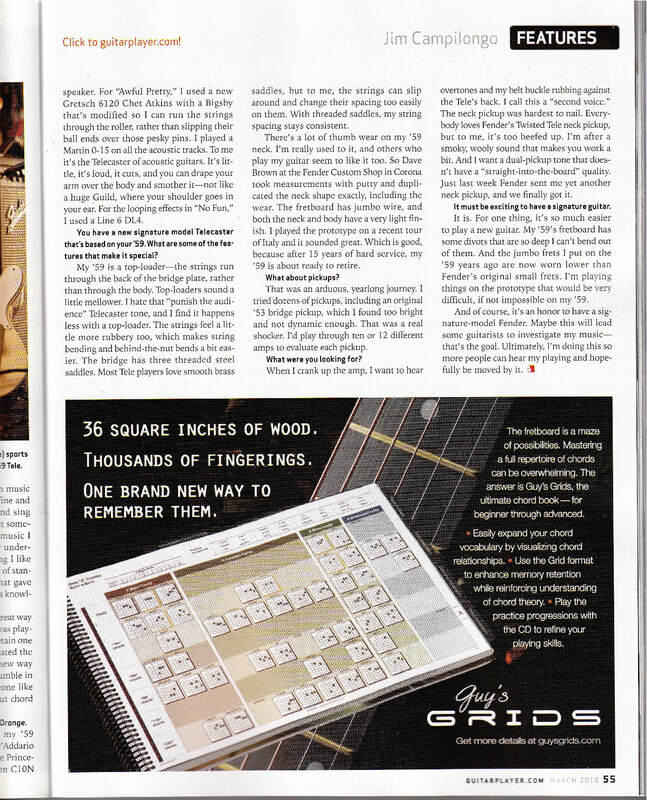 Nels Cline appears on two tunes and Guitar Moderne calls it “one of the years 10 best releases”. 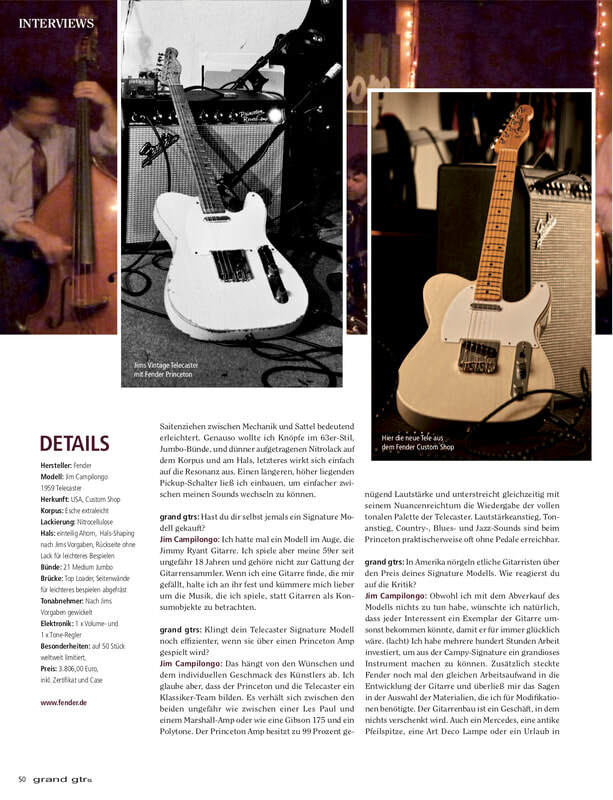 Shaping the trio's personal sound with Campilongo is the formidable rhythm section of Josh Dion (d) and Chris Morrissey (b). 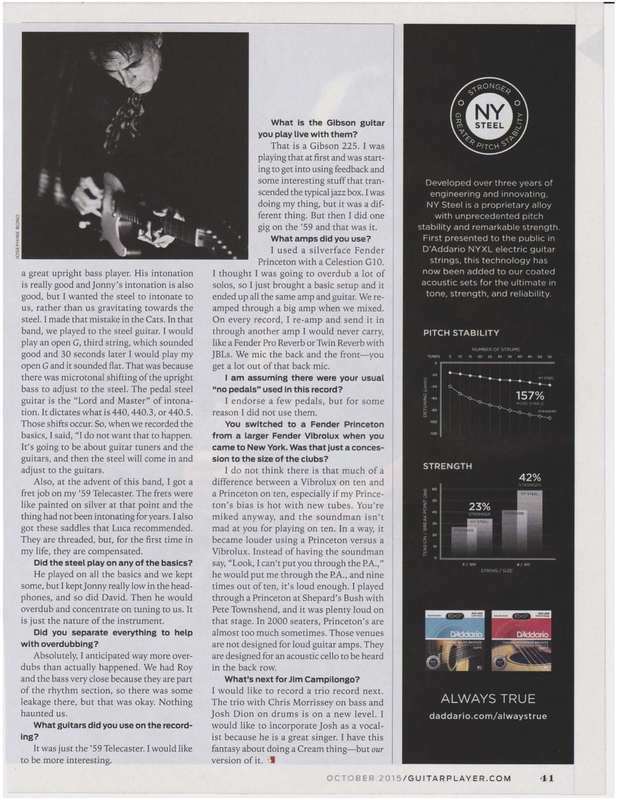 Dion, the front man of the New York art-funk duo Paris Monster also boasts a long and eclectic list of world class collaborators including Wayne Krantz, Greg Allman, Bill Evans and Warren Haynes. 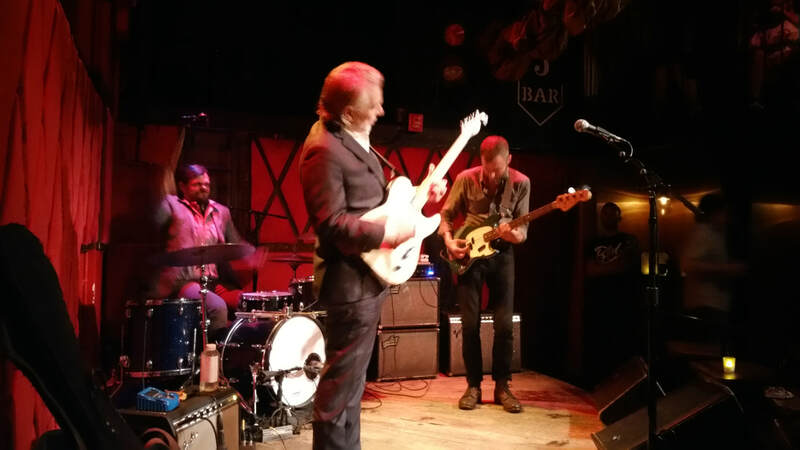 Josh's rare musicianship is as at home painting and pummeling in the trio's iconoclastic rendition of "Manic Depression" as it is crooning their version of the Ray Charles blues "Here Am I". 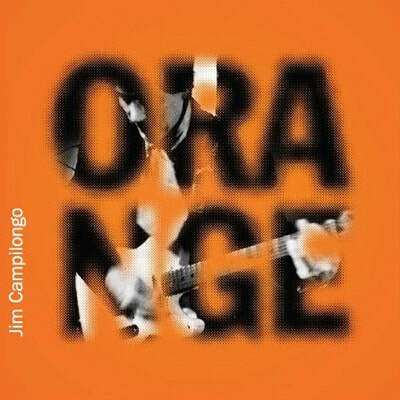 The Jím Campilongo Trio's joyful abandon is urged onward by its bassist, Chris Morrissey. 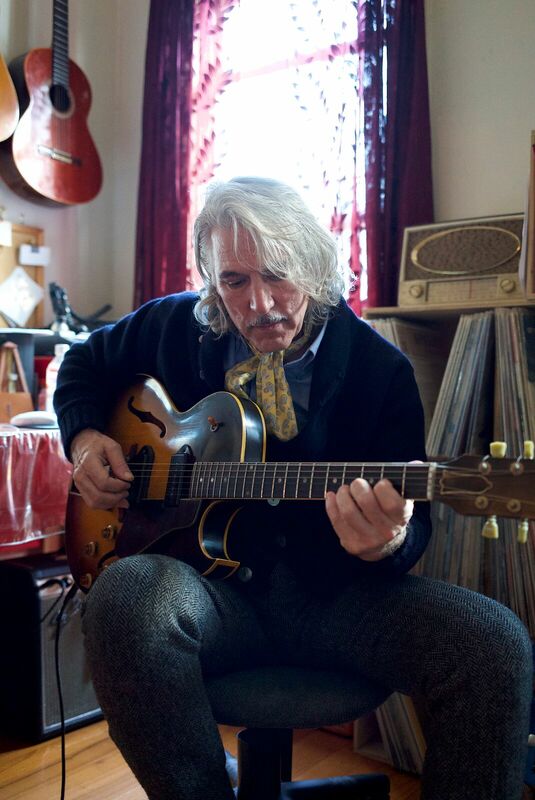 He is a veteran member of globe trekking jazz outfits such as The Mark Guiliana Jazz Quartet and The Dave King Trucking Company, and has held music directorships with popular artists Sara Bareilles and Trixie Whitley. 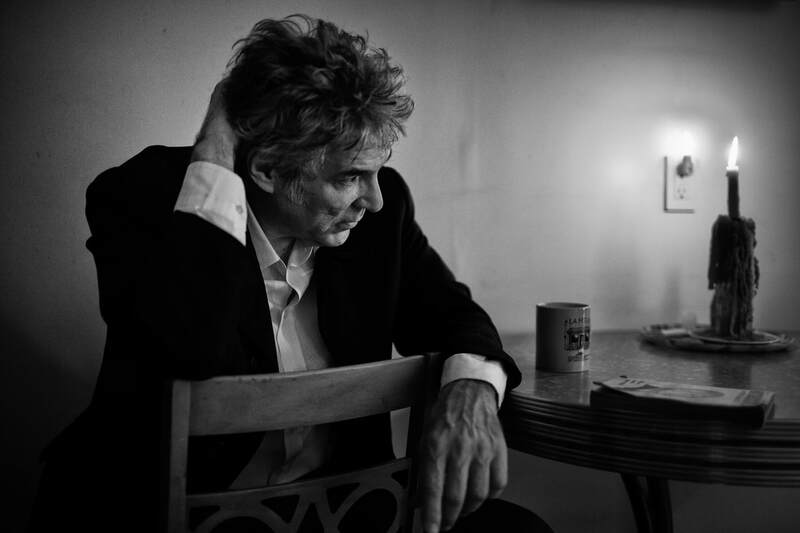 His own writing earned him the Residency Commission from New York's "Jazz Gallery" in 2015. 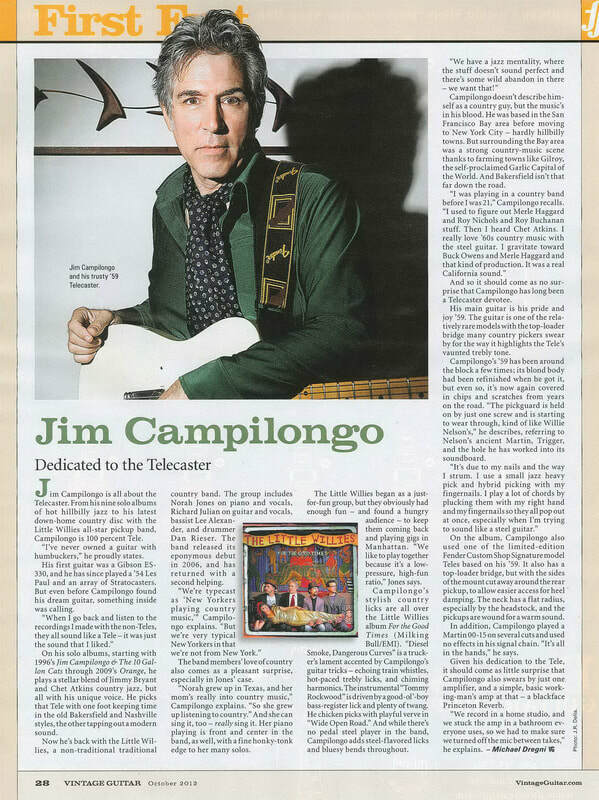 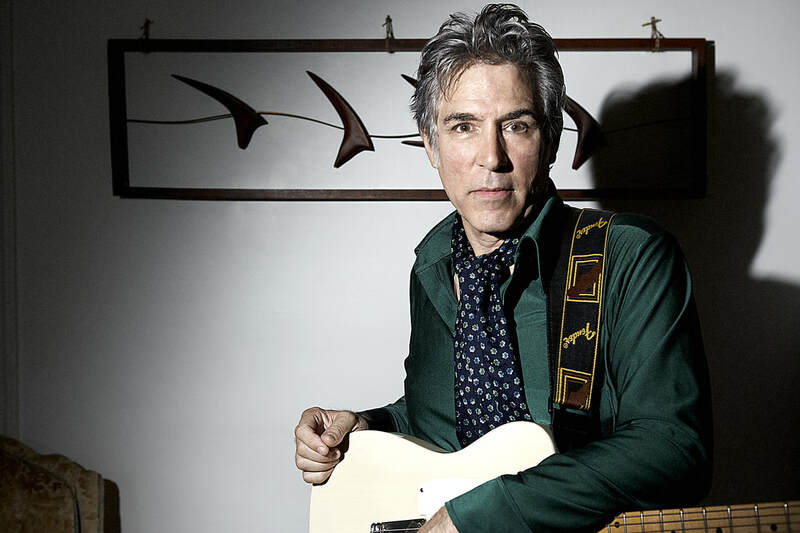 The Jim Campilongo Electric Trio perform every Monday at NYC's Rockwood Music Hall, which Time Out New York recommended as "one of the city's strongest", touting "Monday night means Jim Campilongo." 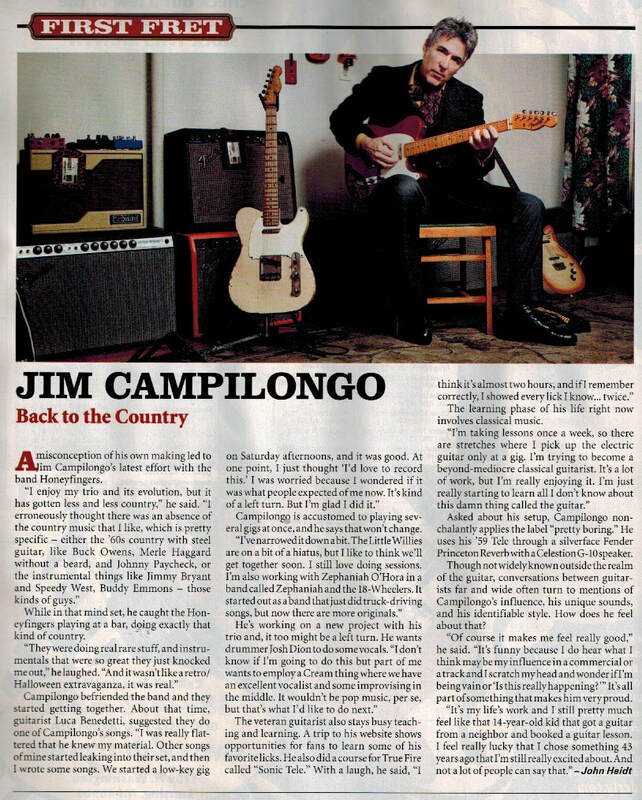 "Through the lean ropy sound of his Fender Telecaster, Mr. Campilongo connects American styles (Blues, Rock, Country, Jazz, R&B) in a sly knowing way." 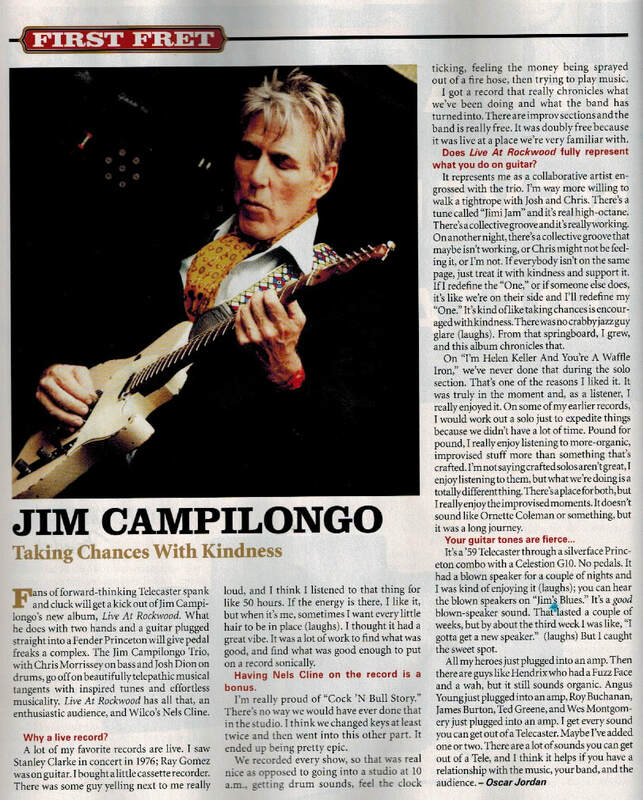 "Jim Campilongo holds court. 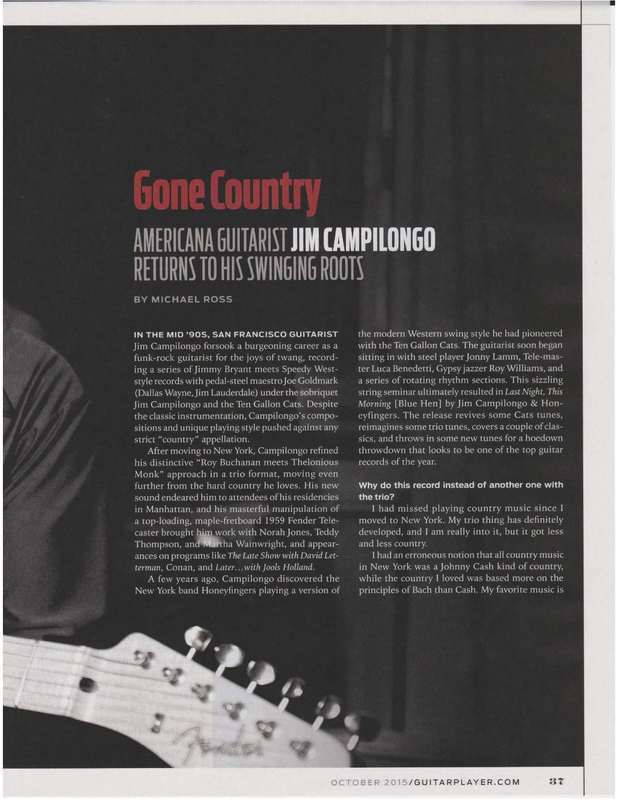 American music is a melting pot of influences, but few guitarists capture the nuances as well as Campilongo does." 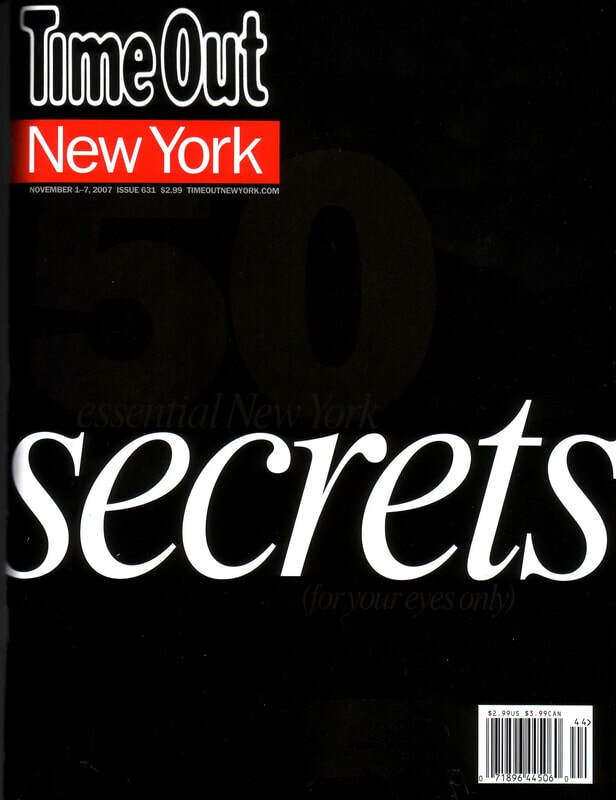 "Campilongo is one of those New York secrets. 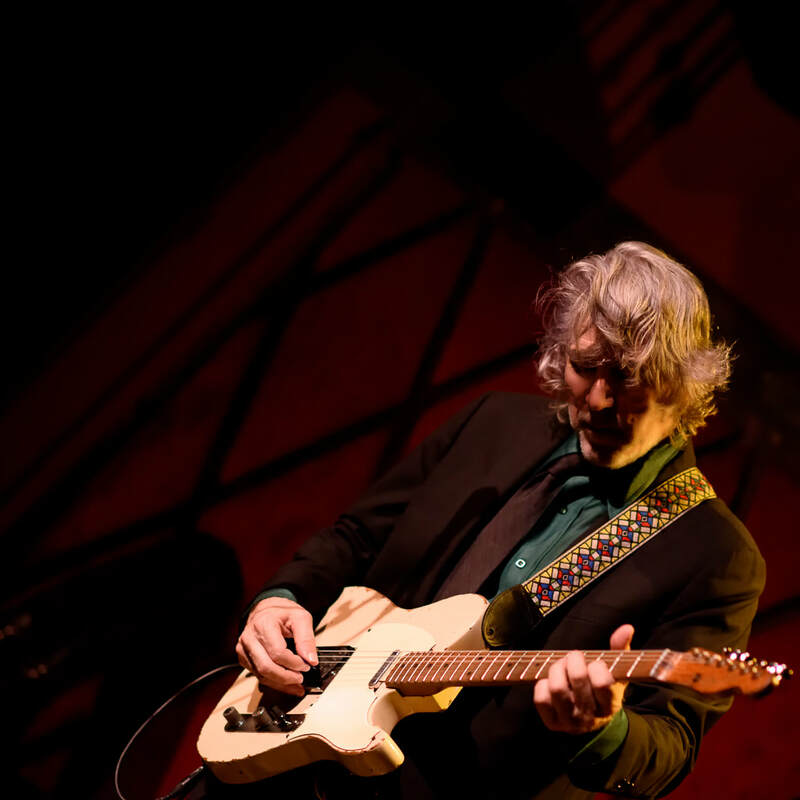 A master of the electric guitar, he weaves in spaghetti western picks, blues chords and jazz refs into his haunting tunes, a combo of originals and covers." 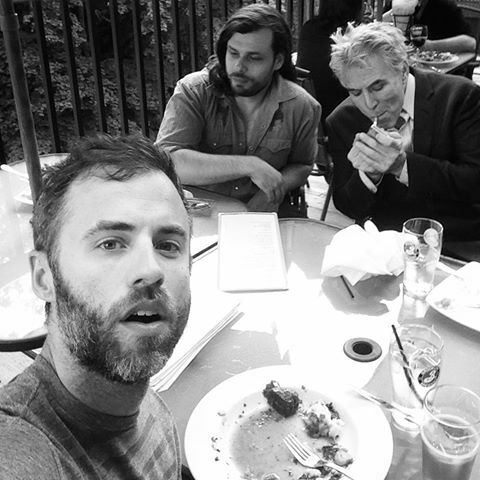 "An engaging improviser whose interest in entertainment is equal to his interest in art. 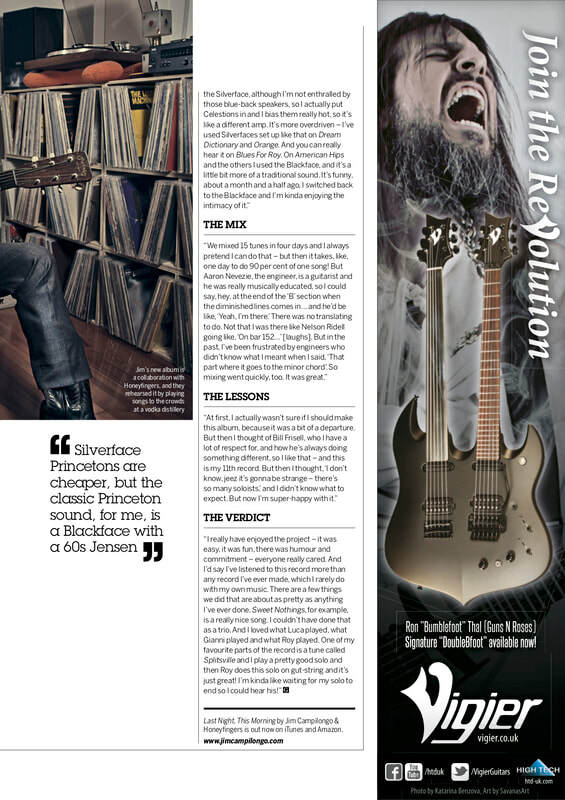 His supple moves can keep an audience enthralled - meaning their asses wiggle and their minds jiggle." 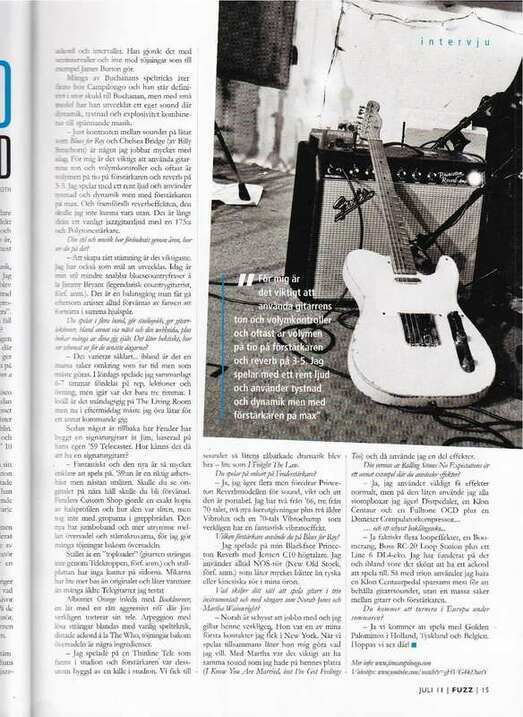 "You've got the makings of a very twisted guitar hero who deserves worshipping. 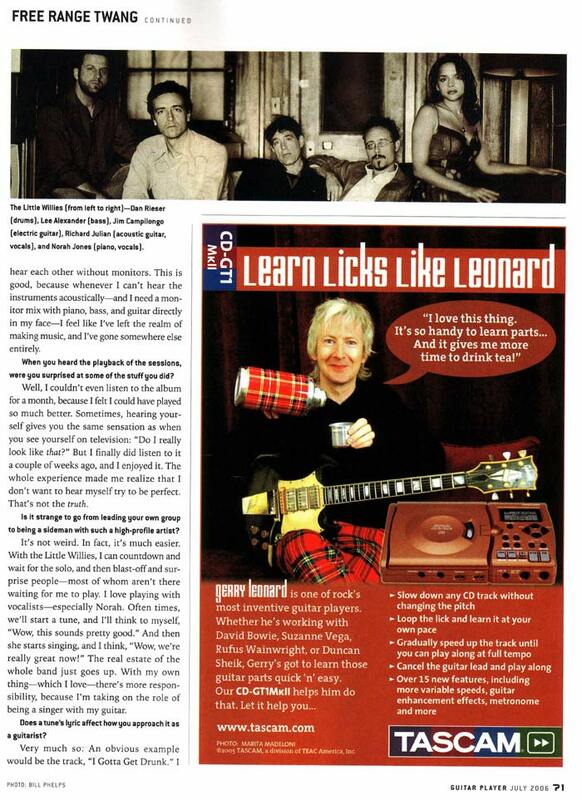 Clever, crafty, quirky and cool." 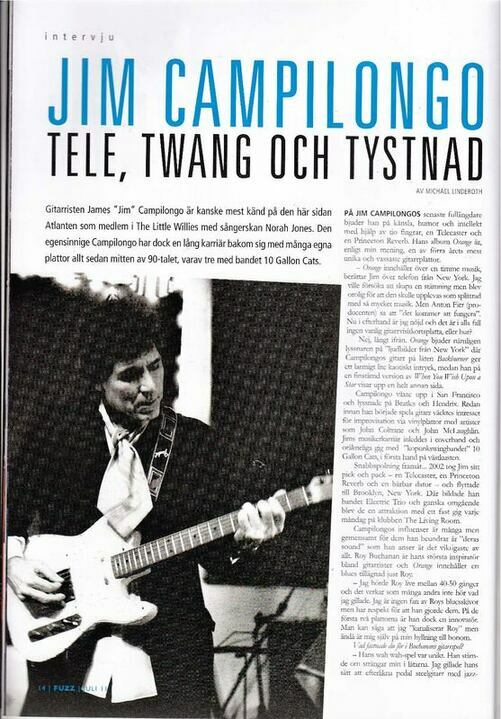 "There it was again: the stinging treble, the spooky overtones, the strings snapping and booming under his hands the sound of a Tele being played as skillfully and exuberantly as it can be played it sounded like nothing and nobody else sounded like Jim Campilongo." 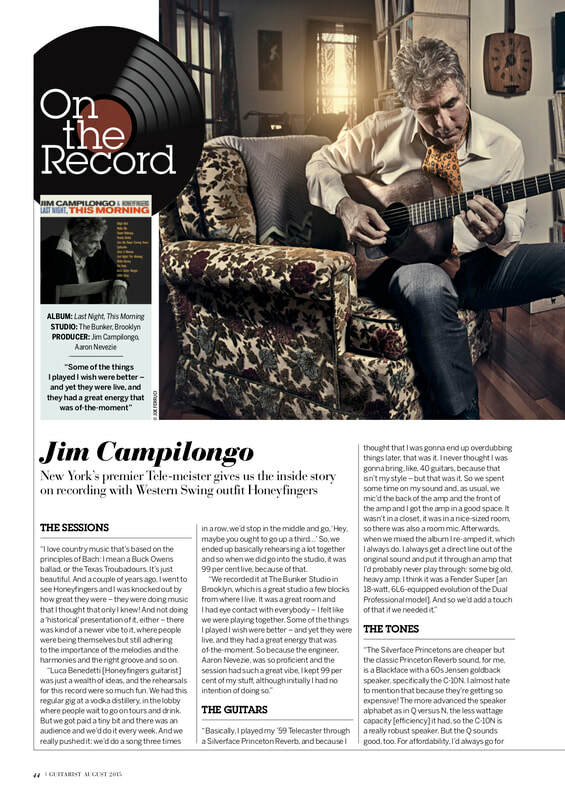 ​"New York has no shortage of guitar heroes but few cover as many bases as Jim Campilongo reveals a range that extends from seductive country-swing to atmospheric jazz and well beyond."